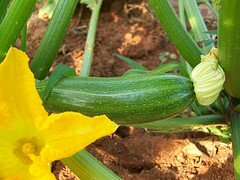 Properly fertilizing and watering zucchini plants will ensure that they continue to produce lots of squash for several weeks. You've spent the time and money getting the seeds and planting them. Now is the time to make sure you get the most bang for your buck. 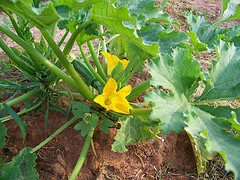 Zucchini squash have a fairly high water content and the plants will benefit greatly from consistent watering. When irrigating zucchini, it's best to water deeply about once a week. Give the plants about an inch of water every week if no rain falls. To determine if the plants need watering, dig 3-4 inches into the soil next to the plants. If the soil is dry, it's time to water. If the dirt is moist at this depth, the zucchini plants are probably in fine shape. When watering zucchini plants, focus a slow stream of water at the base of the plants. Try and avoid watering the tops of the plants as this may encourage diseases to develop. Make sure that the water does not erode any of the soil away from the base of the plants. Exposed roots will lead to insect problems and under-performing plants. Like all plants, zucchini use water to extract nutrients from the soil. Your plants won't be healthy if they don't get enough essential nutrients. During very hot weather, it's very common for zucchini plants to wilt slightly under the afternoon sun. They usually recover nicely overnight. If your zucchini plants are wilted first thing in the morning, it's probably time to water them. 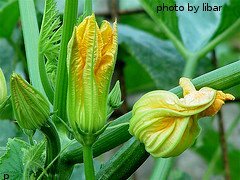 Zucchini plants feed heavily and will benefit from occasional fertilization. It's best to fertilize when the seedlings first emerge and then again when the blossoms appear and the plants begin to set fruit. When fertilizing zucchini plants, it's best to use a balanced, water soluble fertilizer. Mix it with water and apply according to the manufacturer's direction. If you want to grow zucchini organically, mix compost or well-rotted manure into the soil just before planting. After the blossoms appear, you can also apply an organic fertilizer. Most garden centers carry a variety of good, all-purpose organic fertilizers. If you already have a balanced, granule type fertilizer on hand, you can apply it around the plants and water it in well. A 10-10-10 fertilizer works well for zucchini. Avoid letting the granules come in contact with the plants as they may burn. If you live in an area with good, nutrient-rich soil, your zucchini plants will probably thrive without the help of much fertilizer. Remember, fertilizer will usually only make a strong, healthy plant better. It will not rescue a poor, diseased plant and make it healthy. If you've been watering your zucchini plants enough and they have the nutrients they need, you can expect a bumper crop. Now's the time to think about harvesting.